Josiah D. Seale ’03 and Parul Deora ’04 have officially entered the race for Undergraduate Association president and vice president. 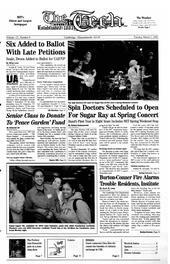 The Spin Doctors will open for Sugar Ray at this year’s annual Spring Concert on April 26 at the Johnson Athletic Center. Five years from now, MIT will receive a brand new garden -- “The Peace Garden” -- to surround the area outside the glass corridor linking Lobby 16 to 26-100. The Cambridge Fire Department responded to three fire alarms at Burton-Conner House this weekend, two of which were false. CMI: A New Beginning ... ?